It is an inescapable fact that we all get old. Yet somehow our childhood football heroes remain frozen in time, forever young and forever athletic. For those of us who grew up in the 80s, the name John Barnes will forever conjure up images of him slaloming through the Brazilian defence with the ball seemingly tied to a boot on a memorable night in the Maracana. Mention David Seaman and my mind races merrily back to Euro 96, where I can still see myself dancing on top of a table in a pub beer garden after his penalty save against Spain had sent England through to the semi finals. Mention Chris Waddle and I close my eyes and see him waltzing past defenders on the wing, his permed mullet flowing as he did so. Well, the less said about the mullet the better. He also recorded ‘Diamond Lights’ with then Tottenham colleague Glenn Hoddle, but perhaps the less said about that the better as well. 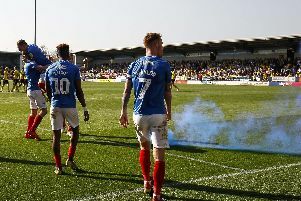 Mention Paul Merson and Pompey fans will quickly return, misty-eyed, to his twilight days when he lit up Fratton Park and helping bring top flight football back to Portsea Island. Sixteen years ago now, but the memories will never fade. As for Matt Le Tissier, I appreciate he might not be every Pompey fan’s pint of craft ale, but even John Westwood would have to concede the Southampton legend was a footballing magician at times. Surely even partisan football supporters cannot blind themselves to sporting sorcery from one of their rivals? Great players, from some great eras. The 80s were a horrific time to be a football fan, but the likes of Waddle, Barnes, Le Tissier and Merson provided much-needed swagger and skill. They were characters too, with their personalities allowed to flourish - no PR consultants or club-employed press officers telling them what not to say, instead encouraging a flurry of banality. In amongst the swearing and the banter and the lads’ humour, therefore, it was a shock to see what some of our heroes look like these days when Harry Redknapp’s ‘Full English’ programme aired over two nights on ITV earlier this week. The aim, for those of you who missed it, was to bring back a team of former internationals - a group of mainly forty and fiftysomethings who were a mere shadow of their former selves fitness-wise - and within 12 weeks train them to take part in an ‘England Legends’ game against Germany. The term ‘Legends’ was pushing it a tad - Neil Ruddock won just one cap, ex-Pompey winger Mark Chamberlain and Lee Sharpe won eight apeice, Ray Parlour won 10 and Rob Lee won 21. But perhaps ‘real’ legends such as Bryan Robson or Gary Lineker either didn’t want to take part, couldn’t for whatever reason, or possibly they were too fit! I wonder if Gazza was asked? Anyway, the programme made for three hours of compulsive viewing, but not because of the football element. No, it was because some of the ex-stars were happy for a nation to see their emotional scars. Merson - whose battles with the demon trio of booze, drugs and gambling is well documented - broke down as he revealed a relapse regarding his betting. Le Tissier said he cried like a baby when he realised his playing career was over, Parlour freely admitted he would sink 50 pints a week during his Arsenal days, and ‘Razor’ Ruddock was given the (not entirely surprising) news that he was a heart attack waiting to happen. Ruddock, now 50 but looking much older due to his shaggy grey beard, was hardly a paragon of healthy living when he was a professional footballer, and since he retired has obviously continued to live the good life when it comes to food and, er, ‘refuelling’. There have been calls for a ‘At Home with The Ruddocks’ tv documentary starring him and his 13-years younger model wife Leah - the same format as the one that starred Ozzy Osbourne a while ago. It was easy to see why. Le Tissier, too, famously despised training - hated doing much running in games, to be honest - and since hanging up his boots has not watched his weight too often. Indeed, at his home we witnessed him pulling out a drawer in his kitchen filled with sweets and other goodies. Same with John Barnes, who was initially supposed to play but ended up being Redknapp’s assistant after injuring his leg. A truly wonderful player for Watford and Liverpool - who never really made his mark on the international scene, despite winning 79 caps - tv cameras allowed us to see today’s John Barnes wolfing down southern fried chicken with his family. Given his portly figure, I guess it’s not a new dietary choice either. A thought struck me - was this the last generation of footballer who will give us, the viewing public, a voyeuristic peak into their post-playing lives? Probably, for they were the last generation of player before the twin advent of increased sports science knowledge and the internet arrived. Better sports science equals today’s players enjoying an overall fitness regime - training, warm-downs, ice baths, daily massages and healthy eating - totally alien to anybody who would have played in the 80s. There are very few rough diamonds in today’s Premier League, because the rough edges have been smoothed off in the search for the best possible physical condition to win games for billionaire owners and chairmen. Look at it this way, can you imagine a similar programme to ‘Full English’ airing in 25 years time and seeing John Stones or Kieran Trippier waddling around looking like Neil Ruddock does now, or Raheem Sterling or Harry Kane revealing they used to quaff 40 pints a week during the footie season? Or Jesse Lingard admitting he washed down a pre-match feast of gammon and mash with Guinness? Or Dele Alli revealing a fried chicken fad when he’s 50? It is also unlikely that any of today’s England internationals will spiral out of control like Merson did. There is so much more help around these days. The likes of Merson and Ruddock might be glad they played in the era they did - no mobile phones charting their off-field escapes - but health wise (physically in Ruddock’s case, and mentally in Merson’s) they would almost certainly be in a better place had they been professional footballers in the 21st century. ‘Full English’ gave us a compelling insight into yesteryear’s stars. We met some of their wives, got a glimpse of their home lives, and a portal into how emotionally hard it must be to give up a job you adore because age has caught up with you. Give up a job you love, and all things - the social get-togethers, the dressing room banter, the emotional highs and lows, the hero worshipping wherever they went - associated with it on a day-to-day basis. With that in mind, you can easily see how some start to ignore their health and drink and eat things they shouldn’t. If the programme did anything, it rammed home the fact that our ex-stars are just the same as anyone else. They might have one day had magic dust in their boots and were adored by millions, but now some are doing fine and some aren’t - some are too fat and could do with a major body MOT, some are heart attacks waiting to happen, some drink too much, and some are battling mental health demons where most days are good, but the bad ones are very dark indeed. Just the same as any cross-section of society, therefore. Paul Merson showed the other night that he is happy to talk, that he is able to cry, and that he is not afraid to show his emotions in public. As a result, there is hopefully a far better ending in sight for him than just scoring in a 4-2 win over a team of former German internationals at Leyton Orient FC.